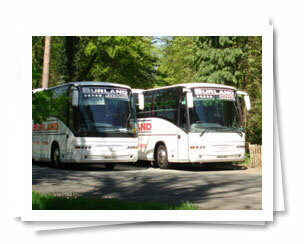 Burland Minibuses was established 16 years ago and Burland Coaches 14 years ago. Burland Coaches provide a range of executive coach excursions around the UK. 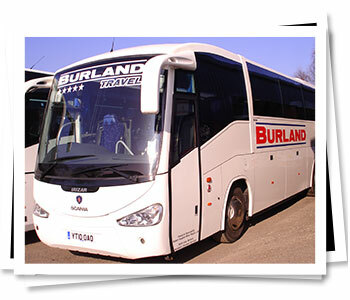 For more information about Burland Coaches, please just get in touch. 2017 I can't think where time goes but we're in 2017 - Happy New Year to all our customers! We are delighted that our excursions are still extremely popular. Tours are planned for Eastbourne, Wales and the North. Please read the testimonials page as there are some very complimentary feed backs. Thank you as always for your loyalty and custom. Matthew joined the team as a valuable member helping us maintain our professional, polite and personal work to please our customers. 2016 This year proving very exciting and with an expanding customers' database. The excursions are still the best in the local area by all the testimonials you kindly send us. Still very happy working with the County, Nantwich TIC, and the group for the Food Festival, Crewe Alex fan club and local walkers and pensioners. Thank you. Rachel joined the team as a valuable member bringing customers with her so we are pleased to welcome her. 2015 Another Andrew joined our team - even though Tom is no longer driving he's still with us for courier work on the excursions - hurray! We have also bought a midi coach 29 seater Mercedes - superb! We're also delighted that the excursions are proving so very popular, tours are expanding - we go all over the country - and County Contracts are increasing. Thank you, as always, to our loyal and pleasant customers. We welcome Graham as another driver, but say goodbye to our working with Nantwich Travel. We welcome Darren as well to our driving team for Burland. Great to have new recruits. 2014 our excursions are proving very popular - now after our 5th year we are travelling further afield and trying to chose places that you all mention you'd like to visit. 2013 saw other additions to our fleet - a wonderful new Scania Century 54 seater coach (see below) and Terry and Steve joined the team with school contracts expanding and private hire increasing all the time. 2013 also saw us purchase the new 'mellow yellow' minibuses and a further white distinctive one. These vehicles all have air conditioning and useful for corporate work etc. 2012 sees the addition of a beautiful new coach - executive, toilet, DVD and boiler to meet all your needs. With this addition we are now working closely with Nantwich Travel Agents who will organise their tours for you and use Burland Coaches to transport you there and back. We're delighted to work closely with them. 2011 Excursions have been an enormous success with all days out almost fully booked, the Christmas Military Tattoo this year is expected to be one of the best - don't miss out! The Tours have grown from a couple of days to weeks now travelling to Torquay, Weymouth, the Isle of Wight and later in the year one in Mull and the other to Aberfoyle, Scotland. All customers very satisfied. Alex, Tori and John moved onto other jobs and Andrew and Peter joined us. 2010: Victoria, Tony and John joined the team and Burland further expanded their excursions and tours with a larger programme and loyalty reductions proving extremely popular. 2009: extended the fleet with another 53 seater - with 3 point seat belts and is LEZ compliant allowing us to go freely into London. Gordon and John joined the team. 2008: Burland Coaches developed their travel into day excursions to such places as York, Southport and The Cotswolds which have been extremely successful. The Garage has also been awarded the Cheshire County Council Golden Spanner Award for Excellent Standards in garage repairs. 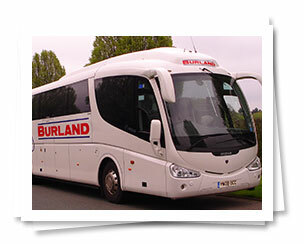 2007: Burland Coaches expanded with a further purchase of a 53 seater coach - sister to our Executive model. Ken and Alex joined the team. 2006: Burland minibuses expanded with the purchase of an Executive 51 seater Coach. Alex and Tom also joined the coach team. 2005: Staff had increased with Judith now also working in the Company. Another 16 seater minibus was purchased as contracts increased. 2003: Burland minibuses was started with just two 16 seater minibuses supplying a service to the community Peter and Paul as the drivers. Weddings are popular with our coaches too, with bows and ribbons they really do look the part - all with air conditioning and our drivers are pleased to assist with all of your requests. We are also working closely with The Crewe Alexandra Club - since their promotion they have asked for us to transport some of their avid supporters to all their fixtures for this season - so again we are delighted to be working with local people to serve the community in many many ways. May I also take this opportunity to thank all our loyal and regular followers and customers who use us on our excursions. You are the backbone of our developing Company.